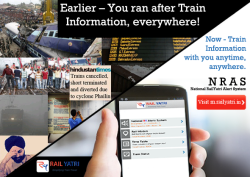 RailYatri.in has launched National RailYatri Alert Service (NRAS) – India’s first Travel Information & Advisory Alerting platform tailored to the needs of RailYatris across the nation who use Indian Railways as the mode of transportation. “Indian Railways runs one of the most distributed yet heavily interconnected functional system known to the modern world with an ability to touch upon millions of citizens on a day-to-day basis.Every day hundreds of announcements, events, and incidents occur on this network which have the potential to impact travel to thousands of locations – directly or indirectly – thereby affecting millions of travelers.We believe that a system as complex and widespread as Railways requires an Information Dissemination platform which can push information in a rapid manner to the right set of people who otherwise may be traveling unawares of changes happening on the travel network.” says Manish Rathi, CEO of RailYatri.in. NRAS is a platform for providing early alerts to train travelers across nearly 8000 locations in India on events that could affect their upcoming travel plans. The system uses customized algorithm to determine the impact of different types of major travel related announcements (new special trains, cancellations, delays, new stoppages, etc. ), incidents (accidents, planned blockages, etc.) and events (historical, current, and upcoming) at a local station or train level. This will now allow train travelers to quickly view/receive time-sensitive alerts that are personalized around their specific station or travel on mobile up to 6 months in advance. To use NRAS, travelers simply have to enter their station/train/journey/PNR details on their mobile phone (called as my-NRAS) and the system will display alerts relevant to the user. There is a special feature for regular commuters that allows them to specify their regular routes and view alerts on their way. My-NRAS also includes a comprehensive database of major recurring events (religious/community gatherings, examination gatherings, weather events, etc.) which are known to result in heavy rush at specific locations (called as “HotSpots”) and warns users in advance if their travel takes them through one or more hotspots. “NRAS also reflects the changing needs of the modern-day Indian Rail Travelers. In the past, information was distributed in response to an incident. Today, the focus is to provide a continuous flow of information to travelers and businesses in a proactive manner to make their trip more predictable. NRAS facilitates this by using mobile-friendly content distribution mechanisms.” says Kapil Raizada, VP, RailYatri.in. Get the best train travel app in India.